If this newsletter does not display properly with photos, please view it at www.richmondbonsaisociety.org . The 2018-2020 Officers of Richmond Bonsai Society! Bonsai information, common questions and answers, monthly growing advice, and bonsai links can be found on our website. RBS 2018 dues are $25 per person or $30 per family, which includes PBA membership. Membership and registration for workshops and other events can now be made via our webpage. It’s that frustrating time of year when the weather teases us into thinking the bonsai growing weather will continue while the days of the calendar slip towards winter. Doing the bonsai two-step, tropicals in the house – tropicals out of the house, seems to be the name of the game. With high 60 and 70-degree days we hate to give up the few remaining warm days and continue to allow out trees to soak up the rays of warm sun for yet another day. With forecast for Richmond showing hints of Fall followed by winter, it’s time to plan how we are going to winter over our trees for a successful 2019 spring.My trees have not realized it’s autumn. The deciduous have not started to visually prepare for the coming winter by dropping leaves to conserve moisture loss. In fact, the maples are covered in green leaves without a hint of any other color. The conifers have candles they are pushing. With the upcoming drop in temperatures, the trees will slowly start to prepare for winter dormancy – ready or not! Protecting your trees during winter is the topic of the Monday night meeting. Please join us at the meeting on Monday night to discuss winter protection of you trees. 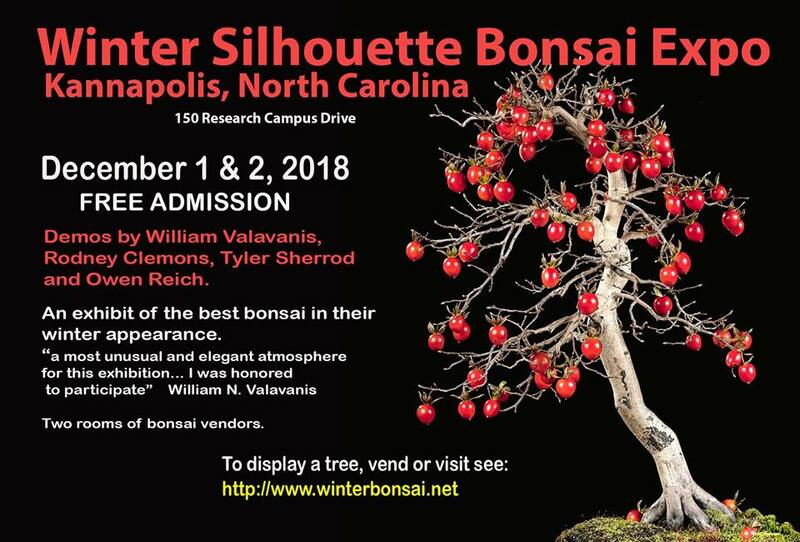 We will have a short discussion followed by a round table discussion of members discussing and sharing their techniques and tips for providing winter protection for their bonsai. Living here in Virginia, we have a unique problem of 30 degrees days followed by high 60s in the middle of February and this may create the problem of exposing our trees to an extended period of high temperatures. The warmer temperatures may cause your trees to break dormancy only to face a night of extended low single digit temperatures. The impact is, buds easily die back, and this may impact the health of your tree. Regardless of the flux temperatures – that we have no control over – we do have control over how we protect out trees from the wind. Winter winds will desiccate a tree and with frozen root ball the tree is unable to absorb water to replace what is lost. Protection from wind is critical for your trees. There are several ways we can protect our trees and as members share how they protect their trees, we hope you will select one or more methods to put in action to protect your collection. In addition to the program on winter care and protection, we will also discuss the unique opportunity to partner with Maymont during their signature event, Garden Glow. We will be planning and discussing the event at the meeting and hope to have members’ participation and support! Recently, we have had some issues with newsletters being blocked by email servers. While we work on it from our end, there is something that you can do to help. Please add the following email to your contacts: info@richmondbonsaisociety.org. This will help keep our messages in your inbox. Also, please check your junk/spam folders and mark any messages from us as “NOT SPAM”. In September, RBS President, Randi Heise, led a demonstration and workshop on wiring. Proper wiring is an essential skill for the bonsai artist that is only learned through practice. Proper wiring allows the bonsai artist to add interest to the bonsai with curved trunks and branches, change branch angles, creation of natural looking pads, all without damaging the tree. Proper wiring makes the wiring attractive while also doing its job to set the structure of the tree. Randi explained the “slingshot” method of wiring where two branches are wired at the same time, starting with the wire at the crotch of the branches and continuing on by wiring pairs of branches with the same wire. 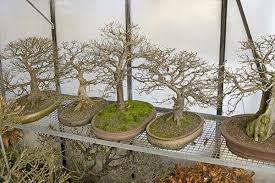 Members then viewed a wiring video of this method by Colin Lewis, a bonsai artist and author of several books on bonsai. Choose wire of sufficient size to do the job of bending the larger of the two branches to be bent – wiring is not for show, it is to bend a branch to make it more interesting or to alter its angle to make the tree more aesthetically pleasing. With the branch at a 90 degree angle from your body, place the wire on top of the branch to be wired. Always grasp the branch with one hand, while wrapping the wire with the other. Use smaller wire as you move out the branch to wire smaller branches; plan ahead, try to avoid crossed wires. Remember “slingshot” two branches for every one wire, and consistent 45 degree angle! Finally, bend the branch to its desired position while being careful not to break the branch always go slow and always support the branches you are bending with your thumbs. ; always make bends where wire is on the opposite side of the bend. Plan your wiring when your deciduous tree is bare and when wiring pines be sure that the candles are hardened off. Be careful not to crush foliage or needles. You need to clean your tree prior to wiring, removing any foliage growing from the crotch of the branches. This is not only applicable to wiring but in you do not want foliage emanating from the crotch of a branch. This process may seem overwhelming in the abstract, but actually doing it is a fun part of the bonsai creation process. In order to be good with wiring you need to practice wiring. Never “practice” on your trees. Find a branch in the woods to practice. Wiring is stressful on your tree. You do not want to add or remove wire from your trees in an effort to practice. After wiring your tree, have a design plan in mind before you place any branches. Moving a branch from “A” to “B” only to move it back to “A” can kill a branch. You should know where you are going to place the branch before you move it in place. With good wiring technique, you can make your bonsai more interesting and pleasing to the eye. 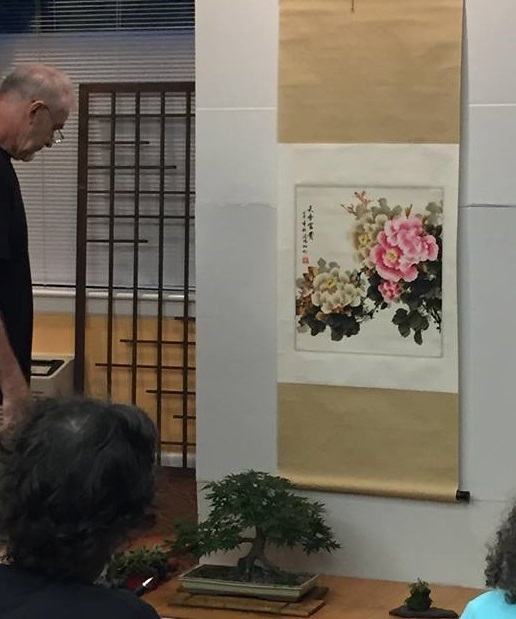 During the August meeting, Jim Ford discussed elements in the display of traditional bonsai. Displaying bonsai is an art unto itself. 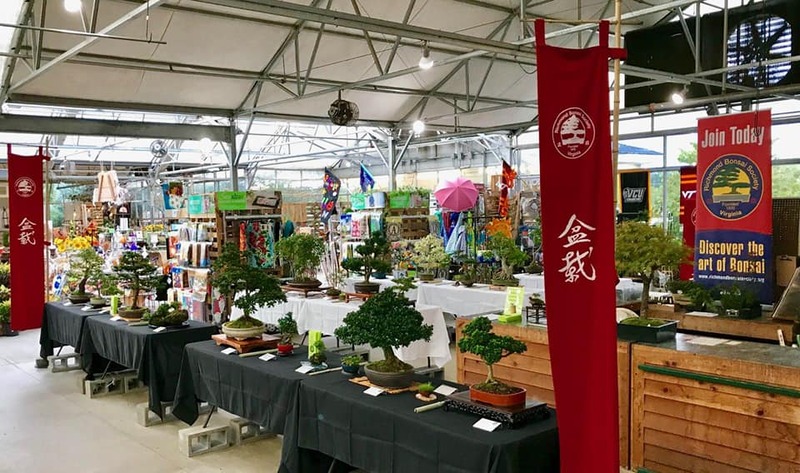 Whether you display your bonsai formally in a club show or informally in your home or backyard, a creative and compelling display will give you and everyone who views it a new appreciation for bonsai. In a good display, bonsai are shown isolated from other bonsai by being placed on a stand to clarify the picture of the tree. 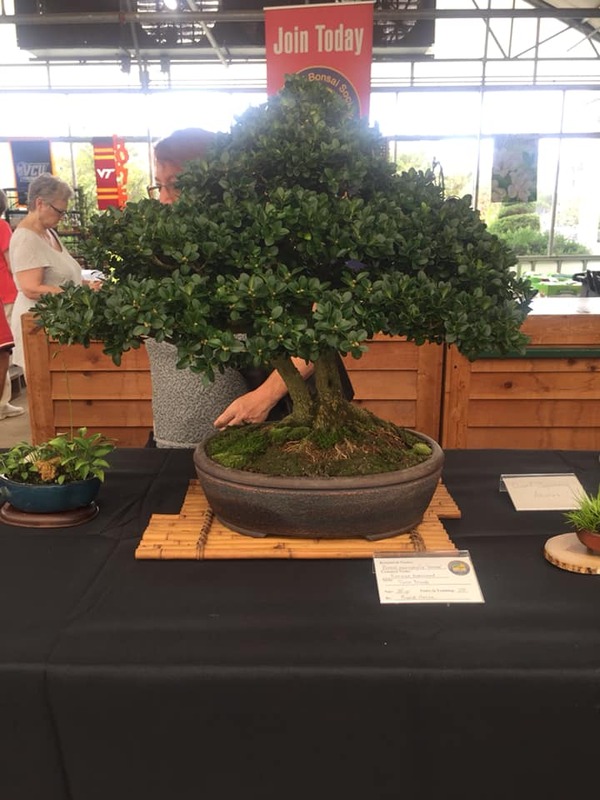 In a formal setting, either in a Tokonoma or in a show exhibit, a bonsai may be shown with other objects to complement it and add to the overall impression of a tree in a landscape. The two other objects in a Tokonoma display may be a scroll and either a suiseki (viewing stone) or an accent plant (a small plant in a pot). In a show display, usually only one additional object is added, either a viewing stone or an accent plant. The first step in properly preparing a bonsai display is preparing the tree and pot to highlight the tree. Leaves that are hanging down, yellowing, or dead should be removed. Wire should be removed unless it is neatly done and unobtrusive. The pot should be cleaned and may be oiled to provide a sheen if unglazed. The goal is to make the tree the star of the display. Contrast and simplicity are most important to a good display. There should be contrast between the bonsai and accent stands, contrast between the bonsai and accent pots (perhaps a glazed and unglazed pots or different shaped pots), and contrast between the bonsai and accent plant foliage. The focus of the display should be towards the center of the display. The foliage line of the bonsai should point to the accent piece and the accent piece should point towards the bonsai. The bonsai stand should work with the tree. A tall stand should be used for a cascade-styled bonsai, with a short stand used for a tall tree. The stand should be somewhat bigger than pot to show stability. The stand should also not take away from the tree by drawing your eye to it by being brightly colored or overly ornate; it should complement the tree. An informal-looking stand for an informal upright bonsai will complement the tree. The choice of accent should be to highlight the environment of the tree. For example, stones can create the image of nearby mountains. Adding a grass as an accent plant works well with a boxwood to represent the surroundings of a deciduous tree. The accent plant can also reflect the season, with flowering plants used in spring. 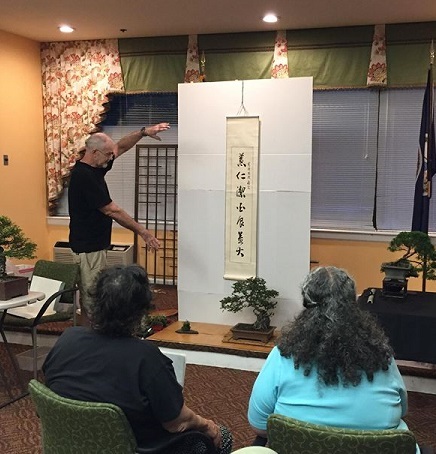 Club members provided critiques of a series of bonsai displays with various trees, stands, suiseki, accents, and scrolls provided by Jim to try to better understand good Tokonoma and show displays. The lessons learned with Jim were apparent at our Fall show in a number of the displays. Next time you attend a show, see how the other elements of a bonsai display increases the bonsai’s attractiveness. We had a great show with lots of visitors. Thanks to everyone who helped, displayed trees, and came to the workshops. We made a lot of contacts and even have had a few people join the society. Come learn all about preparing your trees for winter. Remember that between 6 and 7, before the club meeting, you can bring in any of your bonsai for assistance. This meeting will take place in the ACTIVITY ROOM of St. Mary’s Woods at 7 pm. 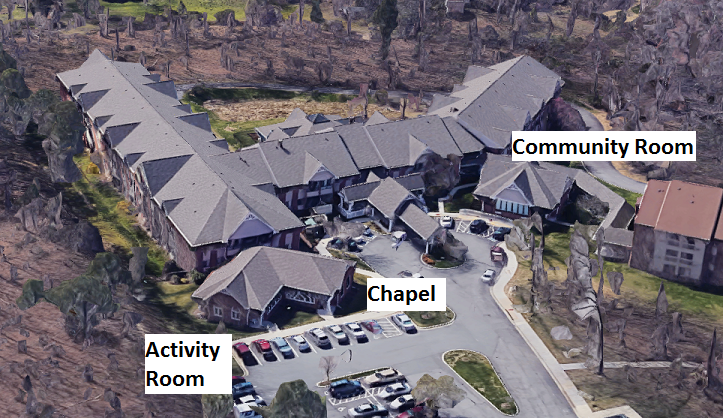 The ACTIVITY ROOM is not where we normally meet, but on the opposite side of the building next to the chapel (see photo below). If you have trees that you want help or advice on, please come about 6:00. RBS will have a special presence at Maymont’s fall event, Maymont Garden Glow. The Japanese Garden will be lit for the season and there will be tours led from the Nature Center each evening. The event runs from October 27 thru November 11; each evening from 6:00 PM until 10:00 PM. There are two ways RBS will have a presence there. We will have a static display of 2-3 trees in the main entry room of the Nature Center along with information about the Society. 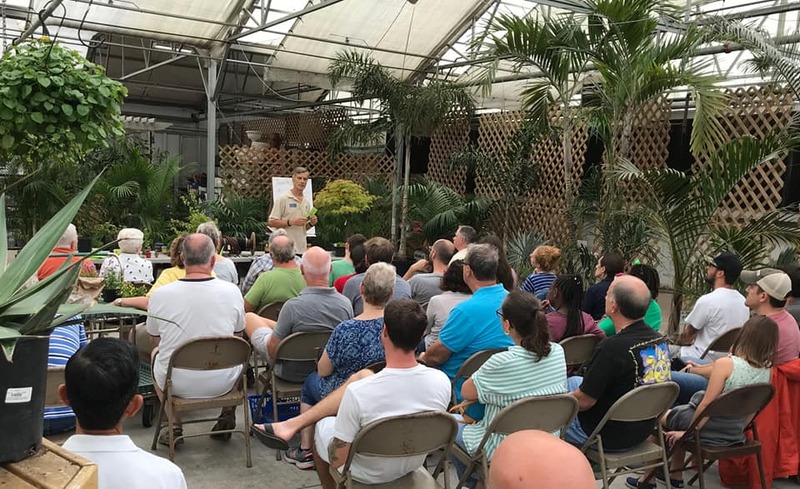 Two, we will do simple bonsai demo/talks on three evenings; Oct. 28, Nov. 2 and Nov. 9 at 6:30 PM, 7:15 PM and 8:30 PM each of those evenings. We will be discussing this event in detail at our October meeting. By now, you should have your tropical trees already in the house, but remember that most outdoor trees native to or appropriate in our climate zone, need to go dormant and “sleep” for the winter. They must be left outside or in a space cold enough for that to happen. They don’t need light, even the evergreens. They don’t need feed. And they don’t usually need water, as long as temperatures stay below freezing most nights, and the daytime highs stay below the 50’s. That’s a normal winter here. In fact, the ice and snow are considered good for them since they can insulate them, protect from pests, and will thaw just as your tree needs water. There are different ways to winterize your trees, most perfectly fine. 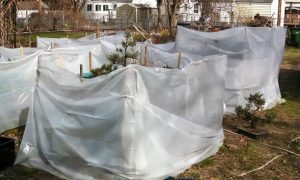 The main thing to remember is that you need to protect the roots (the pot and soil) from drying out in cold, dry winds. Luckily, our winters are fairly mild and this is easy to accomplish. In more colder areas, further protections from deep cold are necessary, but not here. The simplest way to do this is to place them somewhere near a structure, in a window well, or under a shrub, somewhere where they will be protected from the wind, and completely mulch over the pots. You can use pine needles, bark much. Some people use leaves, although they are not ideal for several reasons, including that they can pack tightly and not let water through if needed. If you can not find a protected spot, you could do like I do and build a wind barrier around them, with the top open to let in moisture. They are still mulched over, but the open top lets in rain and snow, providing appropriate moisture when needed. I would only water if we have sustained unusually warm and dry weather. In this photo, i have trees below and on top of the bench, maximizing space in the barrier. 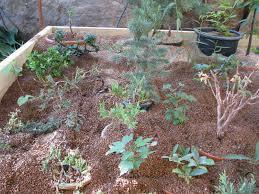 Others like to use unheated hot houses or cold frames that are completely enclosed. These also work, but, not being open to the rain and snow, you must be careful of them drying out. If they do get dry, then be careful to water when warm and NOT before a deep freeze, which could damage roots. Another thing to be careful of when using enclosed protection is that they tend to heat up in the sun during the day. You don’t want temperatures to be much higher than outside. There are a few more things to consider when winterizing. Sometimes mice like to eat soft bark. You can avoid this by placing moth balls on the ground or in the mulch beneath or around your trees. Also, when placing tree, consider which ones you may need to access for wiring during the winter, which ones may come out of dormancy early, or which one you may need to pull out early for re-potting. You may want to tie an piece of ribbon in the top so that you can spot them. Lastly, you may have trees that are actually not zoned for here, but for slightly warmer zones. They will need special attention and placement, maybe somewhere a bit warmer than outdoor temperatures. I experience this with miniature crepe myrtles. If they do not have extra protection from temperatures, they survive, but are weakened and don’t push leaves until late spring, even as late as mid-May. So, if you haven’t made plans for protecting your trees, it is time to do so. If you have further questions, feel free to post them on our Facebook page.